Anesthesiologists have performed facet joint and nerve root blocks for more than 50 years. Initially, these blocks involved the use of palpated anatomic landmarks and a large amount of steroids and/or local anesthetics. As techniques have been refined, fluoroscopic and CT guidance have become popular, because this guidance allows more precise needle placement and thereby a smaller amount of injected pharmaceutical and a lower complication rate. While anesthesiologists have continued to perform the procedures, the trend toward radiologic guidance has resulted in a greater number of injections performed by radiologists, particularly neuroradiologists and musculoskeletal radiologists. The value of having radiologists perform the procedures is derived not only from their expertise in image-guided needle placement and radiologic anatomy but also from their more objective point of view. The treating physician is not influenced by the patient's physical findings or medical history, and he or she does not determine if the patient needs repeated injections. Separation of the referring physician and the treating physician eliminates any conscious or subconscious bias and can only benefit the patient. In this article, the indications for facet and nerve root blocks are considered separately, because although the 2 injections are similar in nature and often performed in the same patient during a workup for back pain, they are designed to treat different pathologic processes. A short description of each technique follows, as well as a description of injection-related complications and coding issues. Zennaro et al found the greatest efficacy of steroid injections in patients with foraminal stenosis, as compared with those who had foraminal disk herniations. Devulder found that SNRB with steroids was associated with decreased treatment scores in patients with failed back surgery syndrome, as compared with scores in those not treated with steroids. Most studies report an average time of pain relief as 1-3 months in those patients that have initial improvement, although some studies have described longer relief in a high percentage of patients. Manchikanti et al performed randomized, double-blind, controlled trials to assess the efficacy of medial branch blocks for treating managing chronic neck or thoracic pain of facet joint origin. [6, 7] Results were similar in patients treated with bupivacaine alone and those who received bupivacaine plus steroid: at 1 year, over 83% of patients with neck pain and 79% of patients with thoracic pain showed significant pain relief and functional improvement. Patients required approximately 3 or 4 treatments a year. For lumbar intra-articular facet joint injections: moderate evidence for short- and long-term pain relief. For cervical, thoracic, and lumbar medial branch nerve blocks with local anesthetics, with or without steroids: moderate evidence for short- and long-term pain relief with repeat interventions. Typically, facet joint injections are performed as a part of a workup for back or neck pain. Since many patients do not have a readily identifiable cause of pain based on imaging studies and clinical evaluation, a stepwise process of different paraspinal injections is often performed. This process may include facet injections; epidural injections; selective nerve root blocks (SNRBs); and, in certain patients, discography. The injection of local anesthetic and steroids into the facet joint is diagnostic and potentially therapeutic. When optimally performed, the injection is made directly into the joint space, though for generations anesthesiologists have been successful in injecting around the joint. Pain relief following a precise intra-articular injection confirms the facet joint as the source of pain. Although some physicians advocate the use of local anesthetic only, most practitioners inject steroids as well, attempting to provide longer pain relief. Long-term relief (6 mo) can be obtained in 30-50% of patients. Patients with lumbar facet pain (so-called facet syndrome) typically present with back, buttock, or hip pain. If the patient has only back pain, this pain may radiate into the buttocks or hips, and the pain is typically worse with extension. A useful test is to ask patients to push the pelvis forward while standing with their hands on their hips, because this movement typically reproduces facet-mediated pain. Radiculopathy, leg weakness, and leg numbness are not considered part of the facet syndrome and suggest nerve root compression, although this may be secondarily caused by facet hypertrophy. Occasionally, synovial cysts (out-pockets of the facet joint synovium) may be symptomatic. Most often, they cause foraminal or spinal stenosis. Typically, on T2-weighted MRIs, synovial cysts are seen as rounded areas of increased signal intensity with a peripheral rim of decreased signal intensity. These cysts are located adjacent to a facet joint. The injection of steroids into the associated facet joint is effective in resolving synovial cysts in 30-40% of patients, although repeated injections may be necessary. Cervical facet pain is not characterized as easily as lumbar facet pain, and it can occur with a variety of symptoms, depending on the level and the individual patient. Headaches, neck muscle spasms, and general or focal neck pain can originate from the facet joints. This pain is typically worse when patients extend or turn their neck. In particular, the upper cervical facets can often cause occipital headaches. As in the lumbar spine, radiculopathy or arm weakness and/or numbness should suggest an alternative diagnosis. Nerve root blocks are a useful tool in the workup for back pain, but they are used in a different patient subset than are facet joint blocks. Nerve root blocks attempt to anesthetize the desired nerve for diagnostic purposes, and steroids are used in an attempt to produce long-term relief, primarily in patients with radiculopathy. Multiple causes of radiculopathy have been discovered. Pressure on the nerve may result in an autoimmune response that can elicit pain. Because the venous drainage lies on the outside of the nerve, pressure on the nerve increases the venous pressure, causing a compartment syndrome within the substance of the nerve. This syndrome causes ischemia and pain within the nerve root, and the pain can be referred along the dermatome for the particular root. Phospholipase A has been implicated in radiculopathy as well. This chemical, the production of which is stimulated by extruded nucleus pulposus material, causes inflammation and pain in the adjacent nerve, even when no compression is present. Because steroids have anti-inflammatory actions, injections around the nerve root may reduce the inflammation, decreasing or eliminating the pain. Although an epidural steroid injection may produce the same effect, an SNRB is a more elegant and focused injection that has more diagnostic value than an epidural injection, particularly in surgical planning. When the 2 techniques are compared, injections of a large amount of steroid throughout the epidural space (epidural injections) are mostly of use when the pathology is located centrally in the spinal canal (eg, central disk extrusion) or when 1 or 2 individual nerves cannot be identified as the most likely source of the symptoms during physical examination or imaging studies. Epidural injection can be compared to a "shotgun blast" of steroids, covering a wide range of levels but placing only a small amount of steroid at each level. SNRB is more of a "sniper rifle" approach, with the injection of a relatively large amount of steroid around a specific nerve root. SNRB is useful when 1 or 2 nerve roots are considered to be the likely cause of the patient's symptoms. After diskectomy in patients who have recurrent radiculopathy but no recurrent disk herniation, symptoms are often caused when scar tissue tethers the nerve. Many patients can be treated successfully by using SNRB, although some may require a repeat injection. Patients with disk herniations can be helped with nerve root blocks. Since 90% of disk herniations resolve spontaneously, given enough time, pain relief is important to try to avoid surgery. Because the pain is believed to result from an inflammation of the nerve root and not directly from the pressure of the disk (which by itself causes numbness but not pain), steroid injections can reduce inflammation and pain in many patients. Nerve root blocks can help patients who have symptoms related to a nerve root but no definite radiologic diagnosis explaining the symptoms or who have so many abnormal MRI findings that confirming the origin of the symptoms is difficult. Included in this group are patients with subcostal pain from thoracic nerve roots, many of whom have undergone cholecystectomies or have been treated with gastric acid inhibitors without success. In patients with uncertain pain etiology, SNRB is an effective and accurate means of determining whether a certain nerve root is the source of the symptoms. The procedure is often curative as well. In addition, irritation of the perineural tissue and the sinuvertebral nerve, which innervates the annulus, may be relieved with SNRBs. However, because the generated pain is usually nonfocal, multiple-level diagnostic blocks may be necessary to localize the painful level prior to a therapeutic block. Contraindications to paraspinal injections include a history of allergy to local anesthetics or steroids; coagulopathy; or, in the case of facet joint injections, severe foraminal stenosis (which can become worse if an injection is made into the joint itself). Severe foraminal stenosis is a relative contraindication to intra-articular facet joint injections. Injections into the facet joints can cause joint swelling, worsening a preexisting foraminal stenosis. Small amounts of steroid may be injected gently, but at levels with severe stenoses, parafacet (median nerve root block) injections should be considered. After discussing the procedure and its risks and benefits with the patient, obtain his or her written informed consent (see Complications). Using a model of the spine to demonstrate the procedure facilitates the patient's understanding and confidence and hastens the consent process. Because instances of atopic reactions, including anaphylaxis, and vasovagal responses have been noted during facet injections, one may consider establishing intravenous access via a heparin lock prior to the procedure, to facilitate treatment of such reactions. This step is optional; patients may be screened to see if they are at high risk for such reactions, and heparin locks can be placed in those patients. When a mobile fluoroscopic arm is used, the patient is placed in a prone position and the appropriate site is prepped and draped. In cervical injections, a pillow or bolster is placed under the patient's chest, and the neck is flexed. The patient's forehead is supported on a low cushion or folded towel. Localize the facet joint, using fluoroscopic guidance. Anesthetize the overlying skin, using 1% lidocaine without epinephrine. Then direct a 22- or 25-gauge spinal needle into the desired facet joint. In the lumbar spine, 5-in needles are usually used, although 7-in needles are necessary in select patients due to their body habitus. In the cervical spine, either 3.5- or 5-in needles are usually used. In the lumbar spine, the 3-dimensional curvature of the facet joint can frustrate attempts to find the posterior opening. 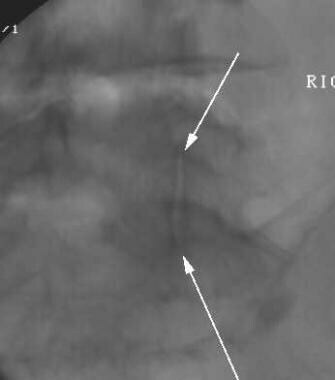 To facilitate access, the joint can be visualized under fluoroscopy while the tube is angled laterally. Because of the shape of the joint, the posterior opening appears first as 2 parallel lines (see first image below). If the tube is directed even farther laterally, the midportion and then the anterior opening are seen as similar lines that appear to offer access. In reality, the outer facet blocks any attempt to access the joints in this projection (see second image below). In the lumbar spine, the lower levels typically require a steep obliquity, while less of an obliquity is required farther up the spine. Image obtained with the correct obliquity demonstrates the posterior opening of the facet joint as 2 dark parallel lines (arrows). Ideally, the needle tip is placed along the medial line and maneuvered into the joint space. Note that this particular joint is narrowed. Image obtained with a steeper obliquity at a different level than seen in the next image demonstrates a facet joint that appears widely patent. However, the angle is too steep, and what is actually shown is the anterior-medial opening. An attempt to place a needle into the joint at this angle would be unsuccessful. Initially, direct the needle toward the medial part of the joint space opening, with the bevel turned to face medially and anteriorly; then incrementally move the needle into the facet joint. Placement of the needle near the opening of the facet joint is best accomplished under live fluoroscopy while a needle driver is used to protect the operator's hands from radiation exposure. However, tactile clues are best used to direct placement of the needle tip into the joint space itself. In most patients, the practitioner will feel a pop as the needle traverses the ligament, although this phenomenon is absent in severely degenerated joints. Contrast medium may be injected to confirm needle location; this is especially useful for practitioners who are new to the procedure. With experience, however, appropriate needle placement can be confirmed by feel and by viewing anteroposterior and lateral projections. In most patients, the needle curves medially once inside the joint space (see image below). In patients with large osteophytes that may block access to the joint, the superior and inferior aspects of the joint may be less involved and, therefore, easier to access. 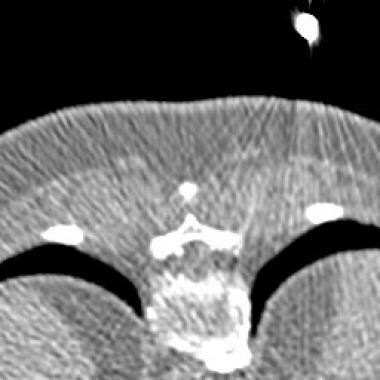 In patients who have extensive hypertrophic changes, CT can be invaluable for determining the best access route. Oblique image demonstrates needles placed into severely degenerated facet joints at L4-5 and L5-S1. Note the medial turn that the needles take to show that they are within the joint itself. When a fixed fluoroscopic device is used, the patient may be rolled into an oblique position to permit visualization of the joint space. Alternatively, for lumbar facet joint injections one may use a posterior approach. In this technique, which was introduced by Sarazin et al, the patient is placed in the prone position, with cushions under the abdomen to flatten normal lumbar lordosis and thereby open up the inferior recess of the facet joint; the spinal needle is then inserted vertically into the inferior recess of the facet joint. This approach lowers the radiation dose to the patient, as the tissue thickness is decreased compared with that of oblique sections. Another advantage is that it does not require a mobile C-arm. In addition, the technique is useful for severely degenerated joints with large osteophytes. Some authors recommend injecting steroids at the site where the medial branch of the spinal nerve enters the bone, near the notch between the transverse process and the superior articulating process. Directing the needle to this location is easier, since the needle does not actually have to be placed into a bony compartment. However, other experts suggest that this injection is less effective than intra-articular facet blocks. Cervical facets pose a different problem because of the severe coronal angulation. Two methods of approach may be used: direct posterior or posterolateral. The posterior approach (see image below), which usually requires a 5-in needle, is technically challenging. It requires a marked caudocranial angulation of the tube, and the needle insertion site is typically in the upper back instead of the neck. An alternative is to direct the tube laterally until the side of the facet is visible and, using a 3-in needle, attempt to place the needle into the joint in this manner. A disadvantage is that the joint space may not be as accessible via this route, although the cervical facet nerve can be injected if joint access is not obtained. Cervical facet injection at C7-T1 shows the needles within the joints on each side. Unlike the upper cervical facet joints, this level can be accessed with only slight angulation. Once the needles are in place, inject a mixture of steroid and 0.25% bupivacaine into each joint. Celestone or Kenalog is the steroid usually chosen; however, other steroids, as well as local anesthetics other than bupivacaine, may be used. The exact amount may vary, although the total amount of injected fluid is not usually more than 2 mL in the lumbar spine and 1.5 mL in the cervical spine. The capacity of a lumbar facet joint is 1.0-1.5 mL and that of a cervical facet joint is 0.5-1.0 mL. Injecting more than the joint can hold may result in a nonselective injection, which decreases the diagnostic accuracy of the procedure. Overfilling the joint usually results in anterior rupture into the epidural space, which may occur even with small amounts of fluid, as the anterior ligament is often fenestrated or partially degenerated. Injecting facets with associated foraminal or spinal stenosis may cause transient swelling of the joint and result in temporary exacerbation of the patient's symptoms. Observe the patient for 15 minutes after the procedure to document pain relief and monitor for allergic reactions. Because of the small size of the needles, activity restrictions are not necessary. 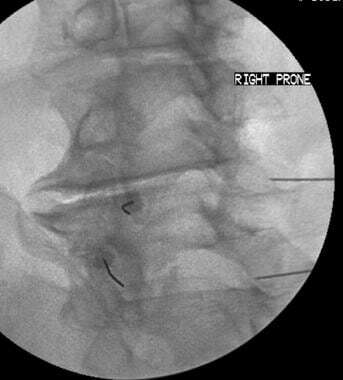 Nerve root blocks have traditionally been performed under fluoroscopic guidance, and this is still the most common method of localization. Since the advent of CT, and more recently CT fluoroscopy, these modalities are being more widely used to direct nerve root blocks. Proponents of fluoroscopy cite decreased procedure time and cost, whereas CT offers the advantages of no contrast medium, more precise needle tip placement, and visualization of important vascular structures. Time limitations often prevent the use of traditional CT guidance, especially in busier units, but with CT fluoroscopy, the time difference between the 2 techniques is diminished markedly. The cost differential between fluoroscopy and CT is 0.6 relative value units (RVUs), and this should be taken into account when a technique is chosen. The choice of technique should primarily be based on the physician's comfort; ultimately, in skilled hands, there is probably no real difference between the techniques. Obtain written informed consent from the patient after explaining the procedure and its risks and benefits. Approach the neural foramen from a posterolateral direction. A thorough knowledge of vertebral anatomy is essential to optimize needle tip placement. Because the nerve root travels within the superior part of the neural foramen, advance the needle, under fluoroscopic guidance, toward the 5- to 6-o'clock position of the pedicle (the 12-o'clock position of the foramen). Ideally, place the needle tip in an inferior position. The needle passes directly anterior and lateral to the superior articulating process of the adjacent facet, and various degrees of angulation are necessary in different patients, depending on both the underlying anatomy and the presence or absence of hypertrophic changes. Because the postganglionic nerve continues in an inferior and lateral direction from the foramen, as well as anteriorly, direct the needle appropriately if access into the outer foramen is blocked. Advance the needle tip slowly until either the patient experiences radicular pain or the needle encounters the posterior surface of the vertebral body (see image below). 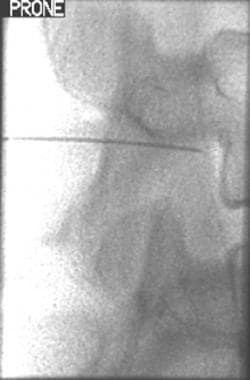 Anteroposterior (AP) view from a selective nerve root block (SNRB) study shows appropriate placement of the needle tip in the superior portion of the foramen. The needle should not be medial to the midpoint of the pedicle. At this point, visualizing the needle tip in the lateral plane allows it to be maneuvered so that it rests in the upper central portion of the neural foramen, directly adjacent to the nerve root and dorsal root ganglion (see image below). 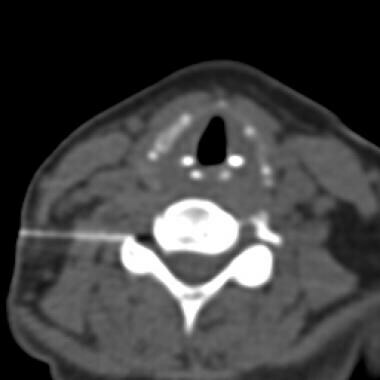 Lateral view shows the needle in the superior portion of the foramen, a position that helps prevent direct neural puncture. Confirm the location of the needle tip by injecting 1-4 mL of a nonionic contrast medium that is approved for use in the thecal sac. If the needle has been properly placed, the contrast medium will flow around the nerve root and may cause radicular pain (see images below). Correlation of any elicited radicular pain, either from the contrast enhancement or from direct contact of the nerve with the needle tip, with the patient's usual pain pattern is useful in confirming that the correct level has been injected. After an injection of contrast material, the nerve is outlined, but no vascular or nerve-sleeve opacification is demonstrated. 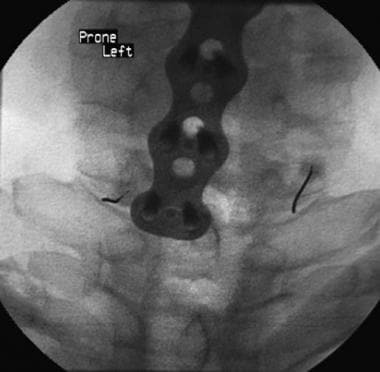 Image from a fluoroscopic-guided nerve root block procedure. Note the contrast material flowing around the nerve root sleeve, indicating proper needle positioning. Courtesy of Phil Landers, MD, The Montreal General Hospital, McGill University Health Centre, Quebec, Canada. Once appropriate needle placement has been confirmed, slowly inject 1% lidocaine with or without bupivacaine (for a diagnostic block) or 1-2 mL of an appropriate steroid mixed with a small amount (0.5 mL) of bupivacaine (for a therapeutic block). Examples of appropriate steroid doses include 6 mg betamethasone (Celestone) or 80 mg methylprednisolone (Depo-Medrol). If the injection is at least partly for diagnostic reasons, it is important to use as small a total volume as possible so that the anesthetic does not spread to adjacent nerve roots or into the epidural space. CT-guided injections are performed with the same patient positioning as in fluoroscopic-guided injections. Place a long marker on the skin (an unfolded paper clip placed lengthwise along a strip of silk tape is an inexpensive and effective marker). Acquire images through the desired neural foramen to determine and measure the best path to the nerve (see image below). CT scan from a scout series prior to a lumbar nerve root block. Note the marker, which allows accurate measurements to determine the optimal site for skin puncture (lines). The right nerve root is seen in the outer aspect of the neural foramen (arrow). Using either sequential CT sections or CT fluoroscopy for guidance, advance the needle until it lies just adjacent to the nerve root (see images below). The source of the nerve root irritation (eg, lateral disk, intraforaminal stenosis, posterior disk) determines how centrally the injection should be directed. Once the needle is in the optimal position, inject the steroid and anesthetic. CT fluoroscopic image demonstrates that the tip of the needle is in a good position in the outer aspect of the neural foramen. 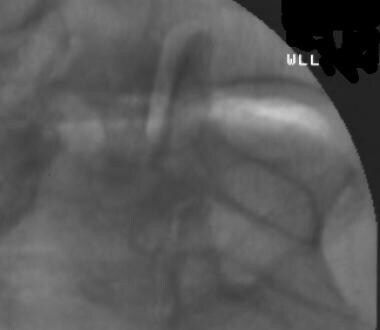 The image is grainy because of the low milliampere setting used in CT fluoroscopy. 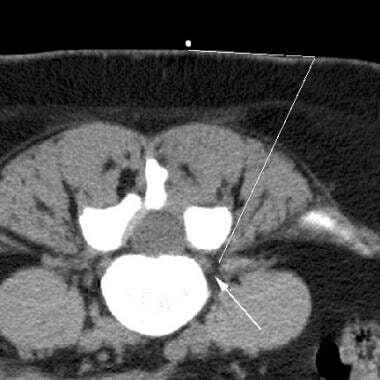 CT fluoroscopic image from a thoracic nerve root block study demonstrates the needle tip in the outer aspect of the neural foramen. Thoracic nerve root blocks can be more difficult than lumbar or cervical blocks because the ribs can obstruct a clear path to the neural foramen, particularly in patients with scoliosis. 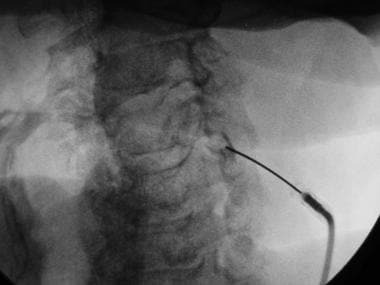 A cervical SNRB using fluoroscopic guidance is performed with the patient in the supine position. The skin entry site should be approximately at the same level as the foramen, or slightly anterior. Use a 25- or 22-gauge spinal needle and direct it at the appropriate neural foramen; the superior facet provides a useful landmark as a target. To avoid injury to the vertebral artery, direct the needle into the posterior portion of the foramen. Do not advance the needle beyond the outer portion of the foramen; in fact, the needle can be placed outside the foramen with similar efficacy and less risk. The injection of contrast medium is critical to outline the nerve root (see image below). Contrast should never fill vessels, and it does not normally fill the subarachnoid space. The total volume of the local anesthetic and steroid should be smaller than that used in the lumbar spine because of the smaller anatomic area. A maximum of 0.5 mL is recommended for a diagnostic block and 1.5 mL for a therapeutic block. Contrast material should flow around the nerve root when needle placement is checked. This finding confirms that the needle is not within a vessel or the nerve root sleeve. Note that the needle is in the posterior portion of the outer neural foramen. 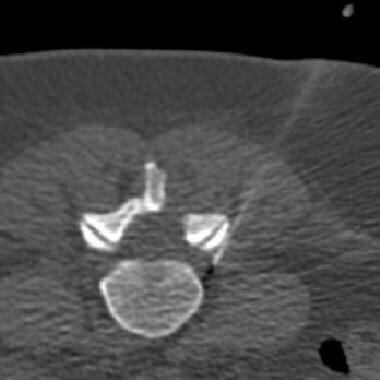 When cervical selective nerve root blocks (SNRBs) are performed with CT or CT fluoroscopic guidance, the patient undergoes scout imaging, and the nerve root is identified; this part of the procedure is the same as with SNRBs in the lumbar and thoracic spine, although patient positioning is different. Choose the skin entry site, then measure and mark it. Insert a 25- or 22-gauge 3.5-in needle posterior to the jugular and carotid vessels, and maneuver the needle to just outside the neural foramen. Again, the needle tip should stay in the posterior portion of the foramen (see image below). In some cases, the needle may need to be inserted through the neck musculature or through a preplaced 1.5-in 20-gauge needle to prevent the weight of the needle hub from displacing the needle tip anteriorly during scanning. An alternative method is to use a few sterile gauze pads to provide a cushion on which the needle hub can rest while the needle is not actively held. 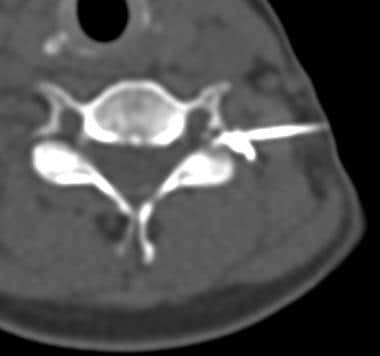 CT fluoroscopic image from a cervical nerve root block demonstrates the appropriate needle path and the placement of the needle tip in the lower aspect of the neural foramen. A lateral approach avoids the carotid and jugular vessels and, as in this case, often can prevent puncture of the sternocleidomastoid muscle. Once the needle has been placed, confirm extravascular location of the needle tip by injecting a small amount of contrast medium (see image below). The injection of a small amount of contrast material under the guidance of a few seconds of CT fluoroscopy can be used to confirm the extravascular location of the needle. Caution the patient that transient weakness may occur in the distribution of the injected nerve root if the motor root also becomes anesthetized. Support the patient when he or she stands up and for the first 15 minutes after the injection. Lower bupivacaine doses result in a lower incidence of motor weakness, but with proper needle placement, motor weakness should be a relatively rare occurrence. Observe the patient for at least 15 minutes after the procedure to document pain relief and to monitor the patient for motor weakness and allergic reactions. Because of the small size of the needles, activity restrictions are not necessary. In most patients, the success of the procedure in alleviating symptoms will be evident within the first 15 minutes after the injection. However, the author has treated patients who experienced no initial relief with bupivacaine, yet their symptoms resolved over the next few days. Do not conclude that the injection is unsuccessful until 1 week after the injection. Always review the patient's radiologic file prior to each procedure. This review prevents confusion when the order reads, for example, "L5 nerve root block," but the patient has transitional anatomy and 4 lumbar-type vertebrae. In addition, in some patients, MRIs may indicate other reasons for the symptoms, such as disk extrusions or synovial cysts that were missed initially. Good service is important and, if possible, offering same- or next-day service is best, at least initially. Send a letter to the referring clinician describing the procedure and any further recommendations. This information expedites the patient's care, making for a positive experience for both the patient and the referring physician. Most primary care physicians are grateful for any suggestions regarding the further treatment of patients with low back pain, because this disease is often difficult to treat. A number of reports have described cases of spinal cord infarcts following selective nerve root blocks (SNRBs), both in the lumbar and cervical spine. It is important to include this potential devastating complication in the consent process because absolute safety cannot be completely ensured; thankfully, however, these types of complications have been rare. 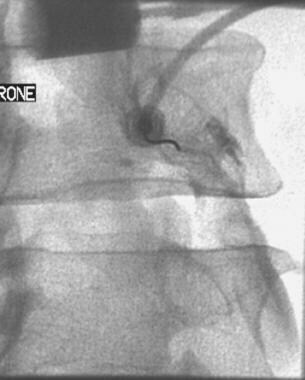 Evidence in some cases suggests that these complications are due to embolism from intra-arterial injection of particulate corticosteroid  ; in many reported cases, however, contrast injection prior to steroid infiltration confirmed extravascular needle placement, which suggests an alternative cause for the complication, such as vasospasm or direct arterial injury from the needle tip. Regardless of the cause, in this author's opinion, contrast injection is recommended to at least potentially reduce the risk of intravascular injection, especially given the necessity, in today's environment, of practicing somewhat defensively. Spinal anesthesia may occur if local anesthetic is inadvertently injected into the nerve root sleeve. Prompt recognition of this potentially disastrous complication is vital during cervical procedures, because the patient's breathing may be arrested. The patient's head should be immediately elevated after the injection to ensure that the bupivacaine flows inferiorly, and intubation supplies should be readily accessible. Some practitioners elevate the head of the table during cervical injections to help prevent this complication. Some patients experience adverse effects from the steroids. These effects can include insomnia, nightmares, and nervousness, although these are transient. Consider the total steroid dose when performing injections at multiple levels. In addition, there is always the risk of a life-threatening idiopathic reaction to any injected medication. These procedure codes are linked to International Classification of Disease, Ninth Revision (ICD-9) codes, which were modified in early 2000. Currently, Medicare approves facet injections for use in spondylosis without myelopathy but not in spondylosis with myelopathy (for obvious reasons) or in postlaminectomy syndrome. Carette S, Marcoux S, Truchon R, et al. A controlled trial of corticosteroid injections into facet joints for chronic low back pain. N Engl J Med. 1991 Oct 3. 325(14):1002-7. [Medline]. Riew KD, Yin Y, Gilula L, et al. The effect of nerve-root injections on the need for operative treatment of lumbar radicular pain. A prospective, randomized, controlled, double-blind study. J Bone Joint Surg Am. 2000 Nov. 82-A(11):1589-93. [Medline]. Riew KD, Park JB, Cho YS, et al. Nerve root blocks in the treatment of lumbar radicular pain. A minimum five-year follow-up. J Bone Joint Surg Am. 2006 Aug. 88(8):1722-5. [Medline]. Zennaro H, Dousset V, Viaud B, et al. Periganglionic foraminal steroid injections performed under CT control. AJNR Am J Neuroradiol. 1998 Feb. 19(2):349-52. [Medline]. Devulder J, Deene P, De Laat M, Van Bastelaere M, Brusselmans G, Rolly G. Nerve root sleeve injections in patients with failed back surgery syndrome: a comparison of three solutions. Clin J Pain. 1999 Jun. 15(2):132-5. [Medline]. Manchikanti L, Singh V, Falco FJ, Cash KM, Fellows B. Cervical medial branch blocks for chronic cervical facet joint pain: a randomized, double-blind, controlled trial with one-year follow-up. Spine (Phila Pa 1976). 2008 Aug 1. 33(17):1813-20. [Medline]. Manchikanti L, Singh V, Falco FJ, Cash KA, Pampati V. Effectiveness of thoracic medial branch blocks in managing chronic pain: a preliminary report of a randomized, double-blind controlled trial. Pain Physician. 2008 Jul-Aug. 11(4):491-504. [Medline]. [Full Text]. Boswell MV, Colson JD, Sehgal N, Dunbar EE, Epter R. A systematic review of therapeutic facet joint interventions in chronic spinal pain. Pain Physician. 2007 Jan. 10(1):229-53. [Medline]. [Full Text]. Schütz U, Cakir B, Dreinhöfer K, Richter M, Koepp H. Diagnostic value of lumbar facet joint injection: a prospective triple cross-over study. PLoS One. 2011. 6(11):e27991. [Medline]. [Full Text]. Schneider GM, Jull G, Thomas K, Salo P. Screening of patients suitable for diagnostic cervical facet joint blocks - A role for physiotherapists. Man Ther. 2011 Dec 20. [Medline]. Pedicelli A, Verdolotti T, Pompucci A, Desiderio F, D'Argento F, Colosimo C, et al. Interventional spinal procedures guided and controlled by a 3D rotational angiographic unit. Skeletal Radiol. 2011 Dec. 40(12):1595-601. [Medline]. Sarazin L, Chevrot A, Pessis E, et al. Lumbar facet joint arthrography with the posterior approach. Radiographics. 1999 Jan-Feb. 19(1):93-104. [Medline]. [Full Text]. Stalcup ST, Crall TS, Gilula L, Riew KD. Influence of needle-tip position on the incidence of immediate complications in 2,217 selective lumbar nerve root blocks. Spine J. 2006 Mar-Apr. 6(2):170-6. [Medline]. Cheng J, Abdi S. Complications of joint, tendon, and muscle injections. Tech Reg Anesth Pain Manag. 2007 Jul. 11(3):141-147. [Medline]. Houten JK, Errico TJ. Paraplegia after lumbosacral nerve root block: report of three cases. Spine J. 2002 Jan-Feb. 2(1):70-5. [Medline]. Scanlon GC, Moeller-Bertram T, Romanowsky SM, Wallace MS. Cervical transforaminal epidural steroid injections: more dangerous than we think?. Spine (Phila Pa 1976). 2007 May 15. 32(11):1249-56. [Medline]. Suresh S, Berman J, Connell DA. Cerebellar and brainstem infarction as a complication of CT-guided transforaminal cervical nerve root block. Skeletal Radiol. 2007 May. 36(5):449-52. [Medline]. Tiso RL, Cutler T, Catania JA, Whalen K. Adverse central nervous system sequelae after selective transforaminal block: the role of corticosteroids. Spine J. 2004 Jul-Aug. 4(4):468-74. [Medline]. American Medical Association. CPT - Current Procedural Terminology. AMA Coding Billing Insurance. Available at http://www.ama-assn.org/ama/pub/physician-resources/solutions-managing-your-practice/coding-billing-insurance/cpt.shtml. Accessed: May 6, 2009. American Medical Association. CPT Code Information and Education. AMA Physician Resources. Available at http://www.ama-assn.org/ama/no-index/physician-resources/3884.shtml. Accessed: May 6, 2009. Centers for Disease Control and Prevention. US Department of Health and Human Services. International Classification of Diseases, Ninth Revision, Clinical Modification (ICD-9-CM). CDC National Center for Health Statistics. Available at http://www.cdc.gov/nchs/about/otheract/icd9/abticd9.htm. Accessed: May 6, 2009. Destouet JM, Gilula LA, Murphy WA, Monsees B. Lumbar facet joint injection: indication, technique, clinical correlation, and preliminary results. Radiology. 1982 Nov. 145(2):321-5. [Medline]. Dooley JF, McBroom RJ, Taguchi T, Macnab I. Nerve root infiltration in the diagnosis of radicular pain. Spine (Phila Pa 1976). 1988 Jan. 13(1):79-83. [Medline]. el-Khoury GY, Renfrew DL. Percutaneous procedures for the diagnosis and treatment of lower back pain: diskography, facet-joint injection, and epidural injection. AJR Am J Roentgenol. 1991 Oct. 157(4):685-91. [Medline]. Fairbank JC, Park WM, McCall IW, O'Brien JP. Apophyseal injection of local anesthetic as a diagnostic aid in primary low-back pain syndromes. Spine (Phila Pa 1976). 1981 Nov-Dec. 6(6):598-605. [Medline]. Helbig T, Lee CK. The lumbar facet syndrome. Spine (Phila Pa 1976). 1988 Jan. 13(1):61-4. [Medline]. Jackson RP, Jacobs RR, Montesano PX. 1988 Volvo award in clinical sciences. Facet joint injection in low-back pain. A prospective statistical study. Spine (Phila Pa 1976). 1988 Sep. 13(9):966-71. [Medline]. Lilius G, Harilainen A, Laasonen EM, Myllynen P. Chronic unilateral low-back pain. Predictors of outcome of facet joint injections. Spine (Phila Pa 1976). 1990 Aug. 15(8):780-2. [Medline]. Lilius G, Laasonen EM, Myllynen P, Harilainen A, Grönlund G. Lumbar facet joint syndrome. A randomised clinical trial. J Bone Joint Surg Br. 1989 Aug. 71(4):681-4. [Medline]. Link SC, el-Khoury GY, Guilford WB. Percutaneous epidural and nerve root block and percutaneous lumbar sympatholysis. Radiol Clin North Am. 1998 May. 36(3):509-21. [Medline]. Lynch MC, Taylor JF. Facet joint injection for low back pain. A clinical study. J Bone Joint Surg Br. 1986 Jan. 68(1):138-41. [Medline]. Murtagh FR. Computed tomography and fluoroscopy guided anesthesia and steroid injection in facet syndrome. Spine (Phila Pa 1976). 1988 Jun. 13(6):686-9. [Medline]. Murtagh R. CT-guided anesthesia and steroid injection in the facet syndrome. Post JD, ed. CT of the Spine. Baltimore: Williams & Wilkins; 1984. 492-5. Murtagh R. The art and science of nerve root and facet blocks. Neuroimaging Clin N Am. 2000 Aug. 10(3):465-77. [Medline]. Murtagh R. The neuroradiologist as pain therapist. AJNR Am J Neuroradiol. 1998. 19:353-4. Quinn SF, Murtagh FR, Chatfield R, Kori SH. CT-guided nerve root block and ablation. AJR Am J Roentgenol. 1988 Dec. 151(6):1213-6. [Medline]. Raymond J, Dumas JM. Intraarticular facet block: diagnostic test or therapeutic procedure?. Radiology. 1984 May. 151(2):333-6. [Medline]. Wagner AL. Anaphylaxis after steroid and local anesthetic injections. AJNR Am J Neuroradiol. 2000 Nov-Dec. 21(10):1977-8. [Medline]. Fast Five Quiz: How Much Do You Know About Mechanical Low Back Pain? News Zero Coronary Calcium a 'Gatekeeper' Screen in Acute Chest Pain?